In 1991, we were asked to build a house organ for the late Stephen Simon in his country home in Woods Hole, Massachusetts, on the southernmost tip of Cape Cod.The organ is built on a gallery in a large sitting room, and was intended for practise, composing, and concerts involving Mr. Simon’s musical family. Unusually, the Great Organ is enclosed in the “Chair” organ case, as was done at Magdalene College, Oxford. This section boasts a Regal stop, with its very short resonators made of turned olive wood and placed horizontally from the bottom of the case. The instrument was completed in 1992. The Simon family commissioned a second organ for their Washington D.C. home in 1996 (see Chamber Organ, USA). 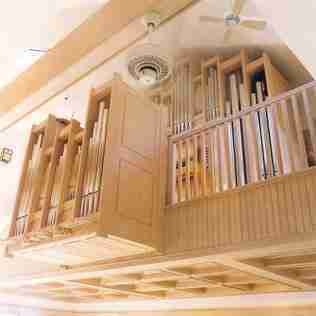 We returned to Cape Cod in 2006, the build the organ for the West Parish of Barnstable. View the Specification of the Woods Hole organ.